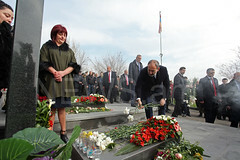 VANADZOR. – Labor strikes and boycotting of classes are in progress Monday in Vanadzor, the third largest city of Armenia, since early morning. The Armenian News-NEWS.am reporter in Vanadzor informed that the workers of the textile factory were the first to protest and, subsequently, numerous other protesters have joined them. Demonstrators are marching in the city streets and urging people to join them. 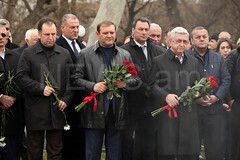 Protests are staged in capital city Yerevan, as well as in Gyumri, Vanadzor, Sevan, and Hrazdan towns of Armenia. 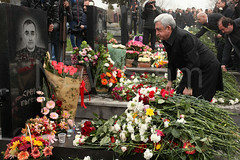 Monday is the eleventh day of the mass demonstrations against ex-President Serzh Sargsyan being elected Prime Minister by the parliament. As reported earlier, Sargsyan and Nikol Pashinyan, the leader of “My Step” initiative—which demands Sargsyan’s resignation—opposition Civil Contract Party Political Council member, and National Assembly “Way Out” (Yelk) Faction head, had a very short talk before the media on Sunday morning. About an hour later, riot police used force against demonstrators on a street in Yerevan and took dozens of people into custody, including Civil Contract Party members and MPs Nikol Pashinyan, Ararat Mirzoyan, and Sasun Mikayelyan. Later, three of them were formally detained.